We have Just Sold out of Star Trek Starships Shuttlecraft Set #3 Part 2 Die-Cast Metal Vehicles. Not to Worry! Fill in the Notify me When Available and you will be the first in line for our restock of Star Trek Starships Shuttlecraft Set #3 Part 2 Die-Cast Metal Vehicles !! From the Star Trek Starships collection by Eaglemoss Publications. Star Trek Starships Shuttlecraft Set #3 Part 2 Die-Cast Metal Vehicles. 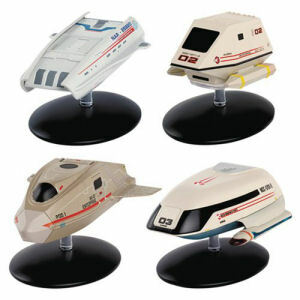 Set of 4 includes the following - Executive Shuttle - Type-15 Shuttlepod - NX Shuttlepod - Type-7 Shuttlecraft.